The Boeing 720 is a four-engine narrow-body short- to medium-range passenger jet airliner. 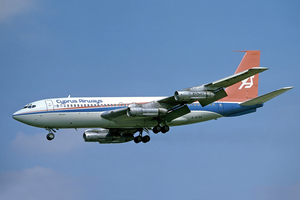 Developed by Boeing in the late 1950s from the Boeing 707, the 720 has a shorter fuselage and a shorter range. The 720 first flew in November 1959 and the model entered service with launch customer United Airlines in July 1960. Two primary versions of the aircraft were built. The original 720 with Pratt & Whitney JT3C turbojet engines entered service in 1960, while the improved 720B with Pratt & Whitney JT3D turbofans entered service in 1961. Some 720s were later converted to 720B specification. Although only 154 were built, the Boeing 720 and 720B were profitable due to the low research and development costs, being slightly modified versions of the 707-120. They were later replaced by the Boeing 727. The 720 is the only Boeing jet airliner not to follow the company's "7x7" naming formula (excluding former McDonnell Douglas airliners, such as the MD-80). Boeing announced its plans to develop a new version of the 707 in July 1957. It was developed from the 707-120 to provide for short- to medium-range flights from shorter runways. The model was originally designated 707-020 before being changed to 720 at the input of United Airlines. Compared to the 707-120, it has four fewer frames in front of the wing and one fewer aft: a total length reduction of 8 feet 4 inches (2.54 m). The new model was designed to a lower maximum takeoff weight with a modified wing and a lightened airframe. The wing modifications included Krueger flaps outboard of the outboard engines, lowering take-off and landing speeds—thus shortening runway length requirements—and a thickened inboard leading edge section, with a slightly greater sweep. This modification increased the top speed over the 707-120. It had four Pratt & Whitney JT3C-7 turbojet engines producing 12,500 lbf (55.6 kN) each. At one point in the development phase, it was known as the 707-020, then 717-020, although this was the Boeing model designation of the KC-135 and remained unused for a commercial airliner until it was applied to the MD-95 following Boeing's merger with McDonnell Douglas in 1997. Because the aircraft systems were similar to the Boeing 707, no prototype Boeing 720 was built; any different systems were tested on the Boeing 367-80. The first 720 took its maiden flight on November 23, 1959. The type certificate for the 720 was issued on June 30, 1960. It was first put into service by United Airlines on July 5, 1960; 65 of the original version were built. The 720B version of the 720 had JT3D turbofan engines, producing 17,000 lbf (75.6 kN) each. The JT3D engines had lower fuel consumption and higher thrust. The maximum takeoff weight for the 720B was increased to 234,000 lb (106,000 kg). The 720B first took to the skies on October 6, 1960, and received certification and entered service with American Airlines in March 1961; 89 720Bs were built, in addition to conversions of American's 10 existing 720s. As a modification of an existing model, the 720 had minimal research and development costs, which allowed it to be successful despite few sales. The company built 154 Boeing 720s and 720Bs from 1959 to 1967. The 720's wing modification was later added on the 707-120B and on 707-120s retrofitted to the B standard. The Boeing 720 is a four-engined low-wing cantilever monoplane. Although it was similar to the Boeing 707, compared with the 707-120, it was 9 ft (2.74 m) shorter in length, and had a lighter structure through use of lighter forged metal parts and thinner fuselage skins and structures. The rearmost of the 707's over-wing emergency exits was deleted on each side, which reduced passenger capacity, while two over-wing exits were an option for higher-density configurations. The 720 uses an improved wing based on the 707 wing. The wingspan remained the same as the 707-120. For the 720, the wing was changed between the fuselage and inner engines by adding a wing root glove. This glove reduced the drag of the wing by decambering the root, which reduced the "middle effect", thereby increasing the effective local wing sweep. The wing root glove reportedly increased the drag divergence Mach number of the wing by Mach 0.02. Though initially fitted with turbojet engines, the dominant engine for the Boeing 720 was the Pratt & Whitney JT3D, a turbofan variant of the JT3C with lower fuel consumption and higher thrust. JT3D-engined 720s had a "B" suffix; some of American's 720Bs were conversions of JT3C-powered 720s. Like the 707, the 720/720B used engine-driven turbocompressors to supply high-pressure air for cabin pressurization. The engines could not supply sufficient bleed air for this purpose without a serious loss of thrust. The small air inlets and associated humps are visible just above the main engine inlets on the two inner engine pods of all 720s and 720Bs; the lack of the turbocompressor inlet on the outer starboard pod (number 4 engine) helps spotters distinguish 720/720Bs from most 707s, which had three turbocompressors. The Boeing 720 lacked an auxiliary power unit, and relied instead on ground power and pneumatic air to power the aircraft's systems, provide air conditioning, and start the engines while on the ground. The normal practice for Boeing 720 aircraft was to start the number three (inner starboard) engine first, then disconnect ground power and air. After start of the first engine, the use of bleed air from that engine could be used to provide necessary air pressure to start the other engines one by one. However, on ground, with ground starting crew already at hand, all four engines were usually started with ground crew help, as this was more reliable and faster. The first aircraft was a production aircraft for United Airlines which flew on November 23, 1959. The type certificate for the 720 was issued on June 30, 1960. The first service of the 720 was by United Airlines on July 5, 1960 on the Los Angeles-Denver-Chicago route. American Airlines followed by putting the 720 in commercial operation on July 31 that same year. On January 2, 1962, Pakistan International Airlines′ first Boeing 720B – a Boeing 720-040B (registration AP-AMG) piloted by Captain Abdullah Baig and copilot Captain Taimur Baig – set a world record during the London-to-Karachi leg of its delivery flight to Pakistan for speed over a commercial air route, making the flight in 6 hours 43 minutes 55 seconds at an average speed of 938.78 km/h (583.33 mph). The 720 was supplanted by the Boeing 727 in the mid-1960s in its medium-range, high-performance market. In the late 1960s, 720 and 720B aircraft were used by the US military to shuttle troops to the Far-East war efforts. The interiors of these planes were stripped of class partitions. Some of these flights originated at Travis AFB California and flew nonstop to Japan. At least one of the landing sites was Yokota AB, Japan, before the troops traveled to their final destinations. After disposal of 720s by the major airlines, many were acquired by second-rank operators in South America and elsewhere. In 1984, a Boeing 720 flown by remote control was intentionally crashed at Edwards AFB as a part of the FAA and NASA Controlled Impact Demonstration program. The test provided peak accelerations during a crash. The performance of fire-retardant fuel was also tested. The first 720 (N7201U) was later renamed "The Starship" and became a private charter jet used mainly by touring rock bands. Its main user was Led Zeppelin in the 1970s. The seating capacity was reduced and a bar with a built-in electric organ was added, along with beds, a shower, a lounge area, a TV, and video cassette player. Honeywell operated the last Boeing 720 in the United States, flying out of Sky Harbor airport in Phoenix. The aircraft had been modified with an extra engine nacelle mounted on the right side of the fuselage to allow testing of a turbine engine at altitude, operating on special certification allowing it to be used for experimental use. This 720B was scrapped on June 21 and 22, 2008. Honeywell replaced their aircraft with a Boeing 757. Pratt & Whitney Canada operated the last flying 720 until 2010. Its final operational flight occurred on September 29, 2010. Pratt & Whitney Canada replaced the testbed with a Boeing 747SP. In May 2012, the former PWC 720 was flown to CFB Trenton, Ontario, to be put on display at the National Air Force Museum of Canada. Several high-density seat configurations delivered to Eastern Airlines included four over-wing escape hatches and brake cooling fans to effect quick turns on short-haul sectors.. These aircraft, designated "720-025", were certificated to carry up to 170 passengers, provided that certain safety requirements were met. Improved variant with four Pratt & Whitney JT3D turbofan engines, American Airlines converted its 720s to 720B standard. An Air Rhodesia Boeing 720 at Salisbury Airport in 1977. Ariana Afghan Airlines 1 x 720B from 1973 and additional 720B was leased. Belize Airways 5 x 720B, used from 1976 until 1980. Air Cambodge 1 x 720 in 1972-72. Air Ceylon 1 x 720, 1 x 720B leased in 1970s. Aerotal 1 x 720B leased. Air Charter Service 3 x 720. Conair of Scandinavia 5 x 720-051B and 5 x 720-025 from 1971 till 1987. Maersk Air 5 x 720-051B from 1973 till 1987. Aeromar 2 x 720 leased from 1979. Aerotours Dominicano 1 x 720 leased. Aerovias Quisqueyana 1 x 720 leased. Agro Air International Dominicana 2 x 720 from 1977. Air Inter 1 x 720 leased. Air India 1 x 720 freighter leased in 1978. Air Bali 1 x 720 leased in 1975 but airline failed to gain approval for charter flights to the United States. Air Niugini 1 x 720 leased from 1976. Air Tanzania 2 x 720 leased. Monarch Airlines 5 x 720-051B and 2 x 720-023B. Alaska Airlines operated both the 720 and the 720B but did not take delivery of either type new. Pan American World Airways 9 x 720B used from 1963-1974 for Caribbean and South American operations. Trans World Airlines ♠ Four leased in 1961. The Boeing 720 has had 23 hull-loss accidents during its career; it was also involved in a number of incidents including nine hijack incidents and one aircraft destroyed by a bomb in mid-air in 1976. Only 12 of the hull-loss accidents included fatalities which totaled 175 deaths in addition to the 81 deaths on the aircraft destroyed in mid-air by a bomb. On February 12, 1963, Northwest Airlines Flight 705, a Boeing 720-051B (reg. N724US), suffered an in-flight break-up over the Florida Everglades about 12 minutes after leaving Miami, bound for Chicago. All 35 passengers and eight crew died. The cause of the crash was determined to be an unrecoverable loss of control due to severe turbulence. On May 20, 1965, Pakistan International Airlines Flight PK 705, 720-040B (reg AP-AMH), crashed short of the runway at Cairo International Airport, killing 121 of the 127 people on board. On December 8, 1972, seven members of the Eritrean Liberation Front hijacked Ethiopian Airlines Flight 708, a Boeing 720-060B, on its way to Paris. Security forces on the plane immediately opened fire, killing all but one of the highjackers (the last surviving hijacker later died in hospital). During the altercation, a hand grenade was detonated that damaged control cables under the cabin floor. However, the pilot put the plane into a controlled dive and managed to land the plane safely back in Addis Ababa with no further casualties. On January 1, 1976, Middle East Airlines Flight 438, a Boeing 720-023B (reg. OD-AFT), was destroyed en route from Beirut to Dubai by a bomb in the forward cargo hold. All 66 passengers and 15 crew were killed. 720-051B 18351, a former Republic of China Air Force VIP aircraft, is on display at Kangshan, Taiwan. 720-047B AP-AXL is on display at PIA Planetarium, Lahore (Pakistan) standing in a park for the public. 720-023B C-FETB was donated to the National Air Force Museum of Canada in 2012 after its last flight. 720-030B HK-749 is on display at Museo de los Niños (Children's Museum of Bogotá), Bogotá, Colombia in Avianca Colombia livery. It was the first jet airplane delivered to a Colombian airline. ^ a b Niles, Russ. "Last Boeing 720 Retired." avweb.com, October 5, 2010. Retrieved: October 26, 2010. ^ a b Angelucci, Enzo; Paolo Matricardi and Adriano Zannino. The Illustrated Encyclopedia of Civil Aircraft: From Leonardo da Vinci to the Present, p. 346. Edison, New Jersey US: Chartwell Books, 2001. ISBN 0-7858-1389-6. ^ "Boeing 707". Flight International. July 25, 1958. ^ a b c d e "Boeing 720". Boeing Commercial Airplanes. Archived from the original on September 3, 2011. Retrieved July 7, 2011. ^ a b c d e Frawley, Gerald. "Boeing 720". The International Directory of Civil Aircraft, 2003/2004. Fishwick, Act: Aerospace Publications, 2003. ISBN 1-875671-58-7. ^ a b c Donald, David, ed. The Complete Encyclopedia of World Aircraft. New York: Barnes & Noble Books, 1997. ISBN 0-7607-0592-5. ^ Lombardi, Michael. "The first KC-135 rolled out 50 years ago this month." Historical Perspective, Start of a Proud Mission: Boeing Frontiers, July 2006. Retrieved: April 17, 2010. ^ Pither 1998, p. 29. ^ a b c "Boeing 720". Airliners.net. Retrieved January 10, 2012. ^ Proctor 2010, p. 120. ^ "Boeing 707/720 Short History." Archived June 29, 2011, at the Wayback Machine Boeing. Retrieved: December 27, 2009. ^ "Boeing 707." airlinercafe.com. Retrieved: December 27, 2009. ^ Proctor 2010, p. 119. ^ Proctor 2010, p. 118. ^ "The Boeing 720". Flight, August 19, 1960. ^ The Ultimate Boeing 707 Guide Retrieved September 5, 2011. ^ Cook, William H. The Road to the 707: The Inside Story of Designing the 707. Bellevue, Washington: TYC Publishing, 1991. ISBN 978-0-9629605-0-5. ^ "FAI Record ID #7679". Archived from the original on September 22, 2017. Retrieved January 1, 2017. ^ Lessard, Jerome (May 10, 2012). "Historic landing a success". Trentonian.ca. Trenton Trentonian. Retrieved March 27, 2013. ^ a b c d e f g h i j k l m n o p q r s t u v w x y z aa ab ac ad ae af ag ah ai aj Pither 1998, pp. 116-219. ^ "History of Air Rhodesia." Viscounts in Africa: The Air Rhodesia Story. Retrieved: 7 February 2014. ^ Pither 1998, p. 133. ^ Pither 1998, p. 142. ^ Pither 1998, p. 151. ^ Pither 1998, pp. 154–155. ^ Federal Aviation Administration (September 1987). "Full-Scale Transport Controlled Impact Demonstration Program" (PDF). Atlantic City International Airport, New Jersey: FAA Technical Center. p. 5. DOT/FAA/CT-87/10, NASA-TM-89642. Retrieved September 2, 2014. This was the first time that a four-engine jet aircraft (Boeing 720) had been flown successfully by remote control. It was also the first time that an aircraft was flown solely and successfully on antimisting kerosene fuel (AMK). ^ Pither 1998, p. 158. ^ Pither 1998, pp. 183–184. ^ Pither 1998, pp. 186–187. ^ Pither 1998, pp. 187. ^ Pither 1998, pp. 212–213. ^ Pither 1998, p. 215-216. ^ a b "Boeing 720". Aviation Safety Network. Retrieved October 19, 2013. ^ "ASN Aircraft accident Boeing 720-040B AP-AMH Cairo International Airport (CAI)". Aviation-safety.net. May 20, 1965. Retrieved March 27, 2013. ^ Pither 1998, p. 311. ^ "AP-AXL - All Pakistan Aircraft Registration Marks". www.aparm.net. Retrieved August 26, 2017. ^ "B720 « National Air Force Museum of Canada". airforcemuseum.ca. Retrieved August 26, 2017. ^ Pither 1998, p. 308. ^ Franco, Javier. "Uniendo el maletín retro de Avianca con sus Boeing 720 y 727". Retrieved December 26, 2014. ^ "Boeing 720." Archived June 22, 2011, at the Wayback Machine Boeing, May 2011. Retrieved: December 27, 2009. ^ "707 Airplane Characteristics: Airport Planning." Archived September 11, 2012, at the Wayback Machine Boeing, May 2011. Retrieved: September 21, 2012. ^ "Boeing 707 Family." Archived April 30, 2011, at the Wayback Machine Boeing. Retrieved: December 27, 2009. Proctor, Jon; Mike Machat; Craig Kodera (2010). From Props to Jets: Commercial Aviation's Transition to the Jet Age 1952–1962. North Branch, MN: Specialty Press. ISBN 978-1-58007-146-8.